Today, Intel introduces new NUC kits and NUC mini PCs to the Intel NUC family featuring 8th Gen Intel® Core™ processors, providing greater choice for a wide range of mainstream computing needs. The new Intel NUCs bring desktop performance in a compact form factor for enthusiasts of all levels to use anywhere. The new Intel NUC kits (NUC8i7BEH, NUC8i5BEH, NUC8i5BEK, NUC8i3BEH, NUC8i3BEK, formerly code-named Bean Canyon) are based on the 8th Gen Intel Core i7, i5 and i3 processors (formerly code-named Coffee Lake-U) featuring Intel Iris® graphics with eDRAM, that can power home theater systems, drive content creator boxes and serve as a personal voice assistant. The new Intel NUC mini PCs (NUC8i3CYSM, NUC8i3CYSN, formerly code-named Crimson Canyon) are an affordable mainstream gaming option designed for playing some of today’s most popular games at 1080p, including League of Legends*, TF2* and CS:GO*. Today, Intel introduces new NUC kits and NUC mini PCs to the Intel NUC family featuring 8th Gen Intel® Core™ processors, providing greater choice for a wide range of mainstream computing needs. The new Intel NUCs bring desktop performance in a compact form factor for enthusiasts of all levels to use anywhere. The new Intel NUC kits (NUC8i7BEH, NUC8i5BEH, NUC8i5BEK, NUC8i3BEH, NUC8i3BEK, formerly code-named Bean Canyon) are based on the 8th Gen Intel Core i7, i5 and i3 processors (formerly code-named Coffee Lake-U) featuring Intel Iris® graphics with eDRAM, that can power home theater systems, drive content creator boxes and serve as a personal voice assistant. The new Intel NUC kits allow integrators and DIYers to customize with their choice of storage, memory and operating system. With this flexibility, the Intel NUC kits offer a range of price/performance options to meet most mainstream users’ needs in an ultra-small form factor. Designed with the right balance of performance and affordability, the new Intel NUC mini PCs (NUC8i3CYSM, NUC8i3CYSN, formerly code-named Crimson Canyon) are an affordable mainstream gaming option for playing some of today’s most popular games at 1080p, including League of Legends*, TF2* and CS:GO*. These NUCs are powered by the 8th Gen Intel Core i3-8121U processors (formerly code-named Cannon Lake) and are the first mainstream NUCs to feature discrete graphics. These NUCs come fully configured with 1TB of storage, either 8GB or 4GB of memory, and Windows® 10 Home and include Intel’s Wireless-AC 9560 CNVi 802.11ac WiFi + Bluetooth 5 solution, two HDMI 2.0a outputs, and 4 USB 3.0 ports – all in a form factor that fits in the palm of your hand and can easily be hidden behind a monitor or mounted under a desk to save space. 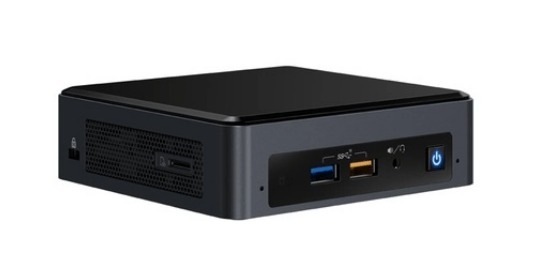 Intel NUCs are mini PCs that offer high-performance capabilities in a space-saving design and are perfectly suited for home theater, home office, entry-level gaming or as a replacement for desktops when space is a concern. These new NUCs offer a number of new options that will fit a wide range of computing needs. The new Intel NUC kits and Intel NUC mini PCs will be available worldwide through Intel distributors and through online retailers beginning in September.